Lately I have been obsessed with looking at homeware. With a new season starting I love seeing everyone's decor on pinterest and instagram and can only ever dream of having a pin-worthy home! I have been looking at everything from plates to lampshades and I thought why not do a quick wishlist on here of a few bits that have caught my eye and are sat in my basket! I've wanted some of these for my flat for so long now and finding them on the ASDA website for just £5 each .... incredible! They also do a # and an & .... I need these for my bed/sofa asap! I've seen these so many times on Instgram and Pinterest and now I've finally found them! I really want to transform my bedroom and I think these with a plain white duvet set would look so cute with my black leather bed .... it needs to happen! Isn't this just gorgeous! Don't ask me where on earth I'd put it.... but I'd find somewhere.. maybe my hallway. It is SO pretty, Wayfair do the greatest homeware. A practical piece now...this looks like the most convenient blogging space ever! A great desk for my laptop and camera and awesome storage alongside for all my products and bits and bobs... hurry up Lottery I need to win you! How cute is this idea! Who needs a normal chalk board when you can have a chalk globe, such a unique idea. I'm a HUGE Christmas lover and obviously a huge candle lover and what do I love even more.... Christmas scented candles! I've been burning my 'Christmas Cookie' candle all bloomin' year and thought the sound of Christmas Baking sounded just as yummy. You can never have too many candles. This is in the wishlist purely because it looks SO cute and at only £6 this is such a lovely little extra to the bedside table. I love me some cake (duh) and this little sign couldn't be truer! The Wizard Of Oz is one of my favourite movies and very close to my heart. My eyes lit up when I saw these two wall art pieces, everything in my flat is pretty much black and white so these would go perfectly - they are a tad out of my price range for now though. 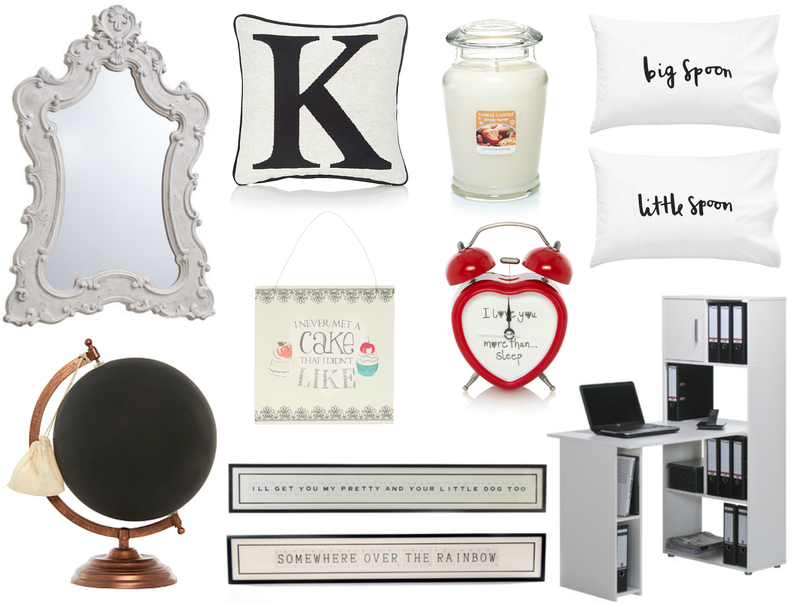 Where are your favourite places to find fun homeware pieces? I love the big spoon and little spoon cushions! Those big spoon little spoon pillows are so cute, i kept seeing them on pinterest- is awesome that you found where you could buy them. I love that globe, I had it in a recent wish list I did as well! The ASDA home range is super impressive at the moment. Those big spoon and little spoon pillows are the cutest thing! That alarm clock. I don't want it, I need it. I need those pillow cases, so cute! There is just something about homeware that makes me so excited. I love the 'big spoon, little spoon' pillow cases, they are adorable. I am also slightly obsessed with the globe chalk board, such a quirky piece. The pillows are too cute! a # cushion sounds perfect! I want too! I have the letter pillows on my sofa with the initials of me and my hubby. I love them! I love those pillow cases!!! I love the Big \ Little Spoons Pillow Cases, I need to treat myself to them. Great picks. I love everything on this!